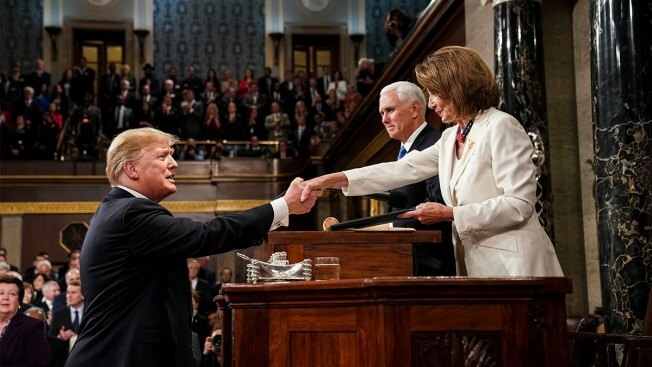 President Donald Trump shakes hands with House Speaker Nancy Pelosi as Vice President Mike Pence looks on, as he arrives in the House chamber before giving his State of the Union address to a joint session of Congress, Tuesday, Feb. 5, 2019 at the Capitol in Washington. President Donald Trump and House Speaker Nancy Pelosi struck starkly different tones in their border security standoff Wednesday, as Trump planned a rally in a Texas border city he says exemplifies the need for a wall and Pelosi said she'd back any bipartisan deal congressional bargainers produce. The contrasting pathways — with Trump set to appear before raucous supporters and Pelosi signaling compromise — came with just over a week until a Feb. 15 deadline for negotiators to reach agreement or potentially face a renewed partial government shutdown. House-Senate bargainers say their talks have become increasingly substantive and some lawmakers — including Pelosi herself — expressed hopes that negotiators might produce an accord as soon as Friday. Participants said the two sides were narrowing differences in their talks. Rep. Chuck Fleischmann, R-Tenn., a negotiator, said Democrats were showing some flexibility in the semantic dispute over the type of physical barriers they would accept while Republicans seemed potentially willing to limit where the structures might be built. "That basically sets the stage for a very reasonable, flexible negotiation," he said. Other unresolved questions include the amount to be spent on border security, and whether — as Democrats have proposed — to reduce the number of detention beds for migrants available to the federal Immigration and Customs Enforcement agency, Fleischmann said. "If they come up with a bipartisan agreement, I'm happy to support it," Pelosi, D-Calif., told reporters. She said she hoped Trump would take "the same hands off" approach. Democrats have been in a position of strength in the talks, after Republicans lost House control in November's elections, Trump forced a record 35-day federal shutdown and surrendered without getting $5.7 billion he's demanded for a wall. Senate Majority Leader Mitch McConnell, R-Ky., has also given bargainers a green light to seek a deal that he's said he hopes Trump would find "worth signing." If Pelosi and McConnell embrace a bipartisan agreement, it could isolate Trump and pressure him to accept it without re-escalating the fight. Trump has threatened a new shutdown or a declaration of a national emergency to access other budget funds if he's not satisfied with a deal — steps members of both parties oppose. Bargainers met Wednesday privately for nearly two hours with federal border patrol and customs officials to hear their recommendations on how to secure the Southwest border. But several lawmakers emerged with differing conclusions. No. 2 Senate Democratic leader Richard Durbin said lawmakers were told the top priority was technology that could screen vehicles for drugs or migrants at border ports of entry. With almost two weeks until another potential government shutdown they are once again scrambling to reach a deal on border security. President Trump and House Speaker Nancy Pelosi are both digging in on their positions. "They don't rule out barriers, they don't rule out fencing, but that isn't the first priority," Durbin told reporters. But Sen. Richard Shelby, R-Ala., said the officials suggested a three-pronged approach using barriers, technology and personnel. He said the closed-door session was constructive. "The dialogue is good. The tone is good. We're talking about substance," Shelby said. He also said that in a phone conversation with Pelosi, "I just said, 'Look, can we reach a yes on this in any way or are we wasting our time.' She said, 'No, keep working together,' and she would like to see a legislative solution, the sooner the better." "We can probably get there on some sort of enhanced barriers with local input," said another negotiator, Rep. Henry Cuellar, D-Texas. Democrats have proposed spending as much as $1.6 billion for border security including some types of physical barriers, but it remains unclear how much more money they'd accept as part of a deal. Cuellar said $5.7 billion for the wall is "not going to happen." Meanwhile, the White House said Trump will hold his first campaign rally of the year next Monday in El Paso, Texas. 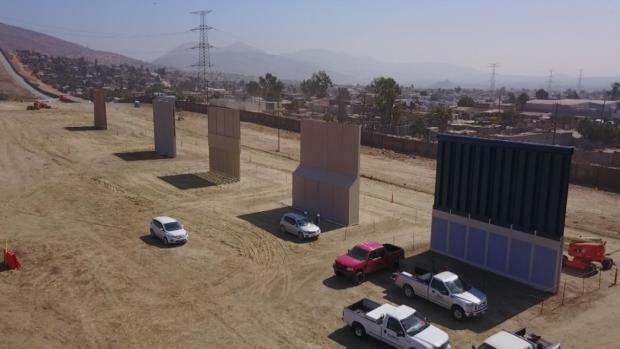 His campaign manager, Brad Parscale, tweeted that the rally will be held "less than 1000 feet from the successful border fence that keeps El Paso safe!" 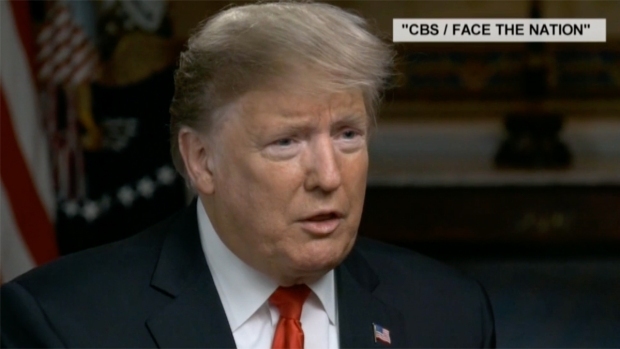 In his State of the Union address Tuesday, Trump cited El Paso as once having "extremely high rates of violent crime. He asserted that with its wall, "El Paso is one of the safest cities in our country." In fact, El Paso has never been considered one of the nation's most dangerous cities and its trends in violent crime mirror national swings. In 2005, the city had a murder rate of 2.5 for every 100,000 residents, compared with a national rate of 5.6. By 2010 after the wall was built, El Paso's murder rate had dropped to 0.9 for every 100,000 residents, compared with a national average of 4.8. Rep. Veronica Escobar, D-Texas, tweeted that "El Paso has been one of the safest cities in the nation long before the wall was built in 2008. #WallsDontWork." "El Paso is safe due to its people, the good community relations with law enforcement, and the trust of all communities in our local institutions," Fernando Garcia, executive director of the Border Network for Human Rights, said in a statement. "El Pasoans should be offended by the way the president used our community to advance his racist and xenophobic agenda."